JOHN MATHER FRAUD: How was he able to publish his papers? Readers, the first and the most absolute requirement for a Nobel Prize in Physics is that the discovery be published in a peer-reviewed journal. So how did John Mather’s patently fraudulent discovery get such peer-reviewed publications? It seems that most of the key publications are in the Astrophysical Journal. I have not been able to verify which editor allowed these publications, but there is reason to believe that Steven Shore was the Editor responsible. 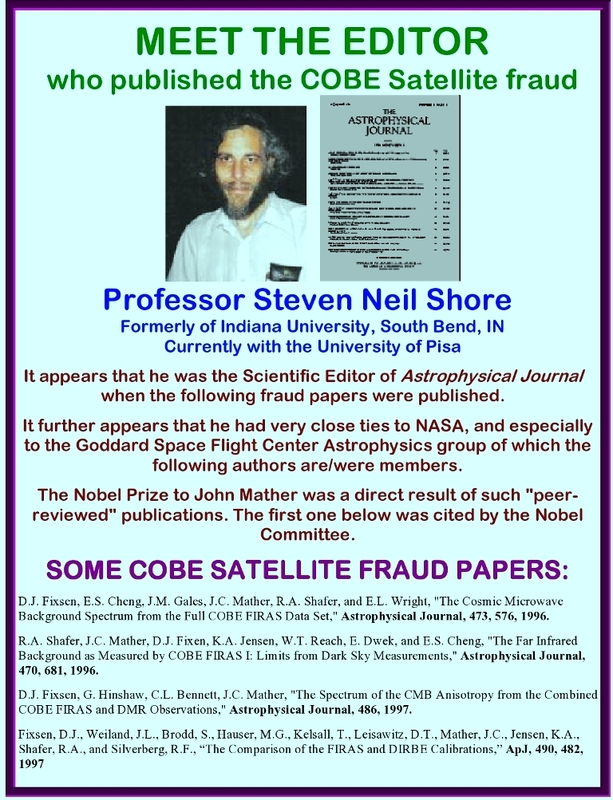 Steven N. Shore, Scientific Editor of Astrophysical Journal, which published a number of papers on the fraudulent COBE Satellite discovery. These papers then formed the basis of the 2006 Nobel Prize for Physics. It appears that Shore was tight with Mather and his colleagues. I submitted to astrophysical Journal a paper called “A Magnetoform Universe” which reported large-scale, source-free magnetic structures floating in space – that could be produced by various cosmic activities. Such structures are forbidden in conventional physics – so this was a completely new idea (later documented elsewhere). Shore is no expert in this area. Yet he did not send the paper to any referees. He made the decision himself. He says that I say that results are not new. This is of course untrue. He then proceeds to make a number of comments that are completely irrelevant to the paper. See his very knowledgeable-sounding response: It is complete oxdung as it relates to the paper. This entry was posted on August 25, 2010 at 2:16 pm and is filed under NASA's COBE Satellite fraud. You can follow any responses to this entry through the RSS 2.0 feed. Responses are currently closed, but you can trackback from your own site.